DEALER: Yes sirree, I can let you have this cherry-red baby for $19,999.99! Plus undercoating and dealer prep. AP Photo/Pablo Martinez Monsivais "Children, this is where we give away your future." DEALER: For a limited time only, I can throw in remote-controlled eight-way power cupholders, for another $999.99. 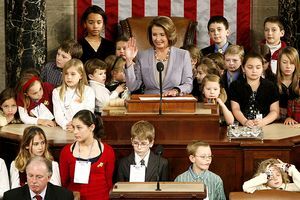 PELOSI: I'll buy them at $75,000. DEALER: Do you want the extended warranty? PELOSI: No. But I'll pay another $25,000 for it. DEALER: Aren't you worried something will go wrong? PELOSI: If it does, I'll just send the bill to the taxpayer. DEALER: So you are willing to pay $150,000 for a $20,000 car? I'll have to go ask my manager! (Disappears into back, pretends to talk to manager, returns.) Lady, you drive a hard bargain. He says that for $31 billion, we will give you absolutely nothing at all.